I tend to get algae build-up on the front of my glass. I have only just begun in marines, but I hear it is a common problem. Can't I just turn the skimmer up to make sure the water gets cleaner or is there a lot more to it than that? Ahh, Alison, if we only had the magic potion for helping folks avoid noisome algae problems First off, Id like to state that almost all systems have some algae problem particularly at first set up, when various organism groups are sorting themselves out, engaged in food and space wars. Established systems however, should be carefully observed to avoid having algae become predominant, particularly toxic forms like Blue-Green Algae (aka Cyanobacteria). How best to keep algae in check? Really first and foremost through avoidance of conditions that favour their proliferation; here were talking mainly nutrient avoidance. Careful feeding, rinsing of frozen/defrosted foods, using RO, perhaps RO/DI water if your mains water has a good deal of nitrate and/or phosphate. Utilizing appropriate algae eating organisms can be of use, though, it is important to study re the various clean up crew selection possibilities to assure they can/will thrive in your system and not be consumed by your other livestock. 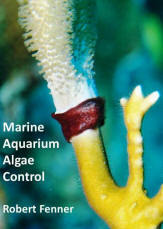 A very appropriate means of algae control is the growing of other algae Macro types like Gracilaria and Chaetomorpha are very popular presently, and can be grown in the main display tank or better in a tied-in sump/refugium with its own lighting on an alternate lighting schedule than the main system. Such algae control less desirable types by using nutrient and producing chemicals that have physiological limiting/allelopathogenic effects. 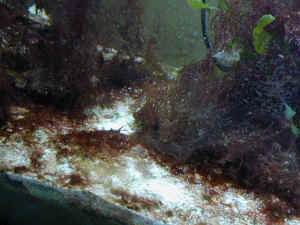 Another very useful technique is using a Deep Sand Bed to precipitate out nutrient as well as provide Protist predator populations that consume pest algae. For advanced systems, the use of Ultraviolet Sterilization and/or Ozonizer can raise RedOx levels, greatly improving water quality in a few ways, including almost assured avoidance of free floating and attached pest algal species. Lastly Ill mention the use, periodic change-out of chemical filtrants These can serve to semi-selectively absorb nutrients that may fuel algae growth. Keeping your skimmer tuned helps a good deal, but of and by itself (unless youre running ozone in conjunction with it), wont keep a system algae-free.